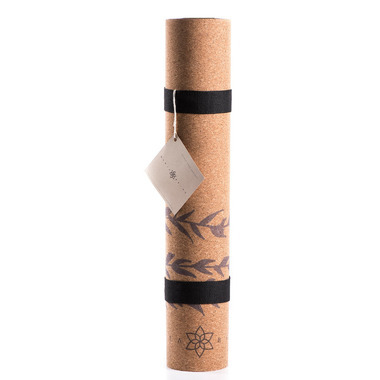 Mukta Being Yoga Mats are made with cork, compared to the likeness of a honeycomb this raw material is smooth, light and elastic. It provides thermal and acoustic insulation which allows for variations in temperature and pressure, making it highly resistant to moisture without ever losing its integrity. Also, cork has natural anti-oxidant and anti-carcinogenic properties, along with anti-bacterial, anti-fungal, hypoallergenic and insect repellent components. No harmful chemicals will be a factor in wellness practices. 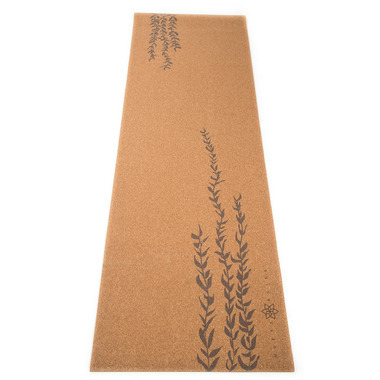 This mat is topped with beautiful cork for natural comfort and grip and backed by a strong layer of pure rubber to ensure everything stays in place. Strap included. Roll it up, cork side out. No need to fold or crease. If it’s wet after a sweat, simply wipe down/lay it out flat to dry. Because of cork’s great properties, no need to clean it so often. When you do want to clean your mat simply warm a cloth, add a drop of soap and give your mat a gentle wipe. Good to go! For added grip you can sprinkle a few drops of water on your mat. Loving my new seaweed mat! It is the perfect mat for flowing smoothly in a practice. I don't slip, nor do I get stuck in one place. The design is beautiful and reminds me to flow freely. Highly recommend!